As the churchly refrain goes, it is right to give thanks and praise to mother! 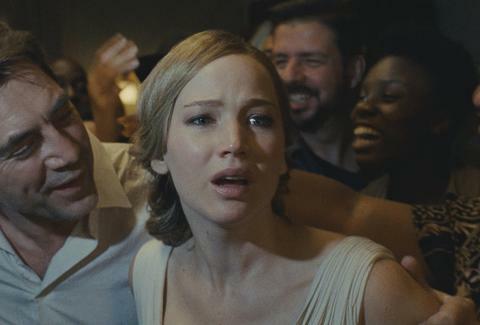 Darren Aronofsky's home invasion thriller -- an allegory about the environment, the Bible, and the misery of dating a moody poet -- has polarized those who've caught it in theaters and potentially driven away prospective viewers in the process. 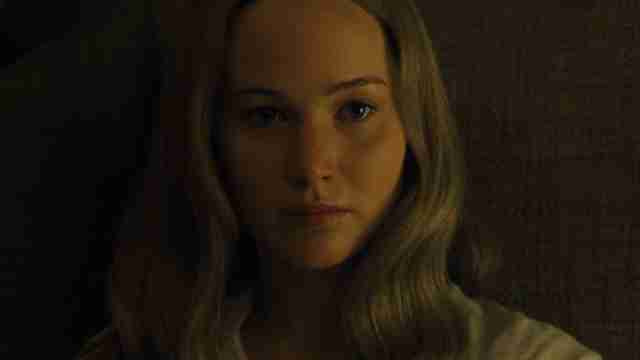 The Jennifer Lawrence showcase, which arrived in theaters on Friday after screening at both the Venice and Toronto Film Festivals earlier this month, may have only made $7.5 million dollars over the weekend, which pales in comparison to the red-nosed dominance of last weekend's horror blockbuster IT, but it's already earned a special place in the hearts and minds of moviegoers looking for a stylish (and funny!) assault on the senses. For everyone else: Well, mother! was a pretty alienating experience. In addition to a review from the New York Observer that branded Aronofsky's provocation as the "Worst Movie of the Year, Maybe the Century" and a notice from the National Review that dubbed it "the vilest movie ever released by a major Hollywood studio," the film also received some withering criticism from audiences. Cinemascore, the Las Vegas based market research firm that tracks and translates viewer responses into letter grades, awarded the movie the rare "F" rating. Clearly, some people did not like this movie. At all. For some context, Cinemascore grades are pretty ludicrous and hardly a beacon of discerning taste. Last year's Will Smith vehicle Collateral Beauty, a loathsome weepie about co-workers tricking their grieving friend into giving up control of his company, got an A- from audiences. The Emoji Movie, a stomach-churning corporate cash-grab, got a B. Even more than Rotten Tomatoes, Cinemascore is where mediocrity gets rewarded with a dutiful pat on the head. So what are the movies that earn the dreaded "F" rating? If you look over a comprehensive list of them, it's easy to spot a few broad trends: Viewers have a tendency to punish violent genre films (Silent House, Wolf Creek, Alone in the Dark) and star-driven efforts from risk-taking directors (Steven Soderbergh's Solaris, Robert Altman's Dr. T and the Women, Andrew Dominik's Killing Them Softly). Sometimes, like in the case of William Friedkin's excellent Bug starring Ashley Judd or Richard Kelly's underrated The Box starring Cameron Diaz, a movie has the misfortune of being a violent genre film that's also a star-driven effort from a risk-taking director. Then you really piss people off. On the surface, that's what happened to mother!. It's reasonable to think that some viewers bought a ticket based on the movie's secretive marketing campaign, which emphasized the more conventional horror movie aspects of the story, and weren't prepared for the thematically ambitious art film they got instead. There's a possibility they were drawn in by the prospect of seeing a major movie star collaborate with the director of Black Swan, a similarly Roman Polanski-indebted thriller that ended up becoming a box office hit and a eventual Oscar winner. Maybe people are really into Ed Harris. Or Michelle Pfeiffer, who almost steals the movie with her bracing and witty performance. Paramount, the studio that ponied up the $30 million needed to fund the movie, has offered a full-throated defense of it in the press. "This movie is very audacious and brave," said the company's president of marketing and distribution Megan Colligan in a statement to the Hollywood Reporter. "You are talking about a director at the top of his game, and an actress at the top her game. They made a movie that was intended to be bold. Everyone wants original filmmaking, and everyone celebrates Netflix when they tell a story no one else wants to tell. This is our version. We don't want all movies to be safe. And it's okay if some people don't like it." The slight jab at Netflix is telling: Studio executives clearly bristle at the tedious bromides about how all quality storytelling now takes place on cable networks and streaming platforms. I can't think of an original film produced by Netflix or Amazon that has the same combination of tenacity and breadth as mother!, a movie that gleefully swan-dives into a thematic soup of contemporary anxieties, religious allusions, and Greek myths. Aronofsky resists the "theory-heavy" storytelling approached preferred by Reddit obsessives in favor of an absurdist tone that often feels more like theater. After a summer when too many major studio releases felt like passive experiences, pieces of content meant to fill a release date on a calendar or bridge a gap between sequels, mother! vibrates with wild-eyed purpose. Its poor box office showing makes sense: This is a film that died so we can live.